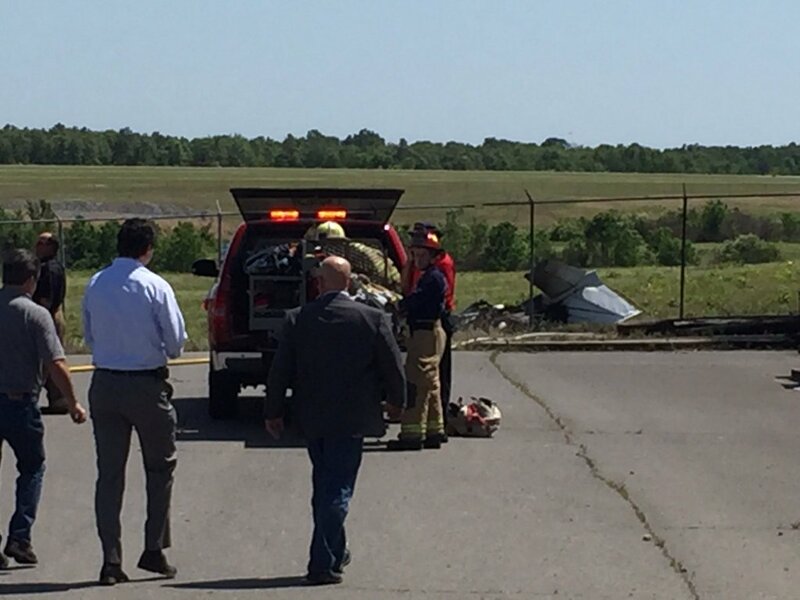 On May 5, 2016, about 1331 central daylight time, a Cessna 310F twin-engine airplane, N6770X, impacted terrain following a loss of control during approach for landing at North Little Rock Municipal Airport (ORK), North Little Rock, Arkansas. 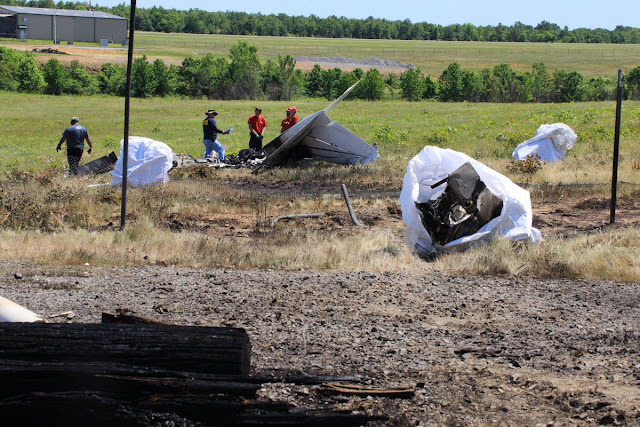 The designated pilot examiner was fatally injured and the commercial pilot sustained serious injuries. The airplane was destroyed by a postimpact fire. The airplane was registered to and operated by Lashbrook, Inc., under the provisions of Title 14 Code of Federal Regulations (CFR) Part 91. Day visual meteorological conditions (VMC) prevailed, and no flight plan was filed for the local instructional flight, which was originating at the time of the accident. The accident occurred during an airline transport pilot checkride administered by a Federal Aviation Administration (FAA) designated pilot examiner. The pilot successfully completed the oral examination before the flight. Following the oral examination, the pilot and examiner discussed the planned sequence for the checkride, which was to depart ORK under visual flight rules, conduct maneuvers south of the airport, then conduct multiple instrument approach procedures to a nearby airport before returning to ORK. The pilot reported that he and the examiner also agreed to work together if an actual emergency occurred during the flight. The pilot stated that he and the examiner did not identify any anomalies with the airplane during the preflight inspection. He noted that the fuel tanks were filled before the flight, and that the fuel samples collected during the preflight inspection did not contain water or particulates. The pilot stated that the left engine started uneventfully. The examiner used a fuel crossfeed procedure to start the right engine using the left fuel auxiliary pump. The pilot did not recall why the examiner performed the crossfeed engine start or if he was simply demonstrating the procedure. Following the right engine start, the pilot repositioned the fuel selectors to a normal configuration (left engine using fuel from the left fuel tank, right engine using fuel from the right fuel tank). The pilot stated that he visually verified the correct position of the fuel selectors and felt the associated handle detents. He then verbally confirmed the positions of the fuel selectors before taxiing the airplane from the ramp. The before-takeoff engine runup was uneventful, during which the pilot did not identify any anomalies with either engine or their respective propellers. The pilot completed the before-takeoff checklist, which included verifying that both auxiliary fuel pumps were in the normal "ON" position, before he taxied the airplane onto runway 5 for takeoff. The pilot performed a normal takeoff from runway 5 and retracted the landing gear during initial climb on the upwind leg. He stated that, during initial climb about 700 ft mean sea level (msl), there was a noticeable change in engine sound and the airplane began to yaw left. He reported that the airplane was climbing at 111 mph (single-engine best rate-of-climb speed, Vyse) when the left engine experienced a partial loss of power to 2,200 rpm. He applied partial right rudder and right aileron inputs to correct for the resulting left yaw. He told the examiner that the left engine was still providing "positive thrust" and stated that they both agreed to keep the left engine running. The pilot stated that the airplane was able to climb to 800 ft msl, at which point he and the examiner agreed to make left turns in the traffic pattern due to the increased number of landing options located immediately north and northwest of the airport. The pilot reported that he was able to maintain 800 ft msl during the left turn from the upwind leg to downwind leg. The pilot stated that the left engine lost additional power during the downwind leg and eventually was unable to provide positive thrust, at which time he decided to feather the left propeller and shut down the engine. The pilot recalled moving the left engine throttle to the idle-stop and moving the left propeller control full-aft; however, he did not recall if he moved the left mixture control to the fuel cutoff position. The pilot postulated that the left propeller did not feather, because full right rudder and right aileron inputs were still required to maintain control of the airplane. The pilot then made a left turn from the downwind leg toward the airport. He stated that, during the left turn, the airplane's airspeed continued to decrease, and that the airplane collided with terrain in a 45° left bank and slight nose-down pitch attitude. After the accident, he was able to exit the airplane from the left cabin door with moderate burns to his head and left leg. He made multiple attempts to extricate the unresponsive examiner from the burning wreckage, during which he sustained serious burns to his face and arms. According to available radar track data, the airplane appeared on radar at 800 ft msl at 1329:43, shortly after it had departed runway 5 and did not climb above 800 ft msl during the remainder of the flight. The airplane continued on the upwind leg for about 24 seconds before it entered a left turn to a southwest heading of 225°. The left turn to the downwind leg took about 29 seconds to complete, which corresponded to an average turn rate of about 6° per second and a turn radius of about 1/3 mile. After completing the left turn to the downwind leg, the airplane continued southwest at 800 ft msl until the final recorded radar return at 1330:56. The final radar return was about 0.28 miles northeast of the runway 17 displaced threshold and 845 ft north of the initial impact with the ground. Airplane performance calculations based on available radar track data and meteorological data indicated that the airplane initially maintained a true airspeed between 98 mph and 111 mph during the upwind leg from runway 5; however, the true airspeed decreased to 97 mph during the left turn to the downwind leg. During the final 20 seconds of recorded radar data, the true airspeed continued to decrease to as low as 89 mph. A witness reported seeing the airplane take off from runway 5 and climb to about 500 ft above ground level (agl) before it began to descend in a nose-up pitch attitude. The witness stated that he did not hear any anomalies with the airplane's engines. He reported that the airplane momentarily entered a steep-banked left turn before it reduced its bank angle to maintain a shallow left turn. The witness stated that the airplane continued to descend during the left turn until he lost sight of the airplane behind a hangar. Believing the airplane was going to crash, the witness drove his truck toward the airplane's last observed position. When he reacquired the airplane, it was still flying in a shallow left turn north of the airport at a slow speed. Although the witness could not hear the airplane's engines from inside his truck, he observed that both propellers were still rotating. The witness stated that the airplane appeared to fly over the water department's storage tanks in what he believed was an attempt to land in a grass area east of runway 17. The witness took a photograph of the airplane shortly before it impacted the ground and burst into flames. According to the file metadata, the photo was captured at 1330:59. A review of the photo established that the airplane was in a 45° left-wing-down bank and a slight nose-low pitch attitude. Additionally, the airplane was on a southerly heading at or below treetop level. A surveillance camera partially captured the impact sequence. The surveillance camera's field of view was aligned to the southwest and focused primarily on an industrial yard located about 450 ft east of the initial impact point. At 1331:00.35, the airplane appeared in the upper right corner of the frame; however, the airplane was partially obscured by a tree that was positioned between the camera and the initial impact point. At 1331:00.54, a fire/explosion emerged and continued to grow as the impact sequence progressed from right to left over a period of about 2.6 seconds. At 1331:02.35, the left engine emerged from the central explosion, tumbling away from the main wreckage, and came to rest in an open field about 1331:07.35. There was a ground fire along the debris path and the associated smoke plumes appeared to drift toward the southeast. There was a power interruption to the surveillance camera between 1331:15.78 and 1337:35.72. When the footage resumed, a majority of the ground fire had subsided; however, the main wreckage remained on fire. There was a second power interruption between 1337:55.76 and 1342:44.66. After the footage resumed, the fire at the main wreckage had been extinguished by responding fire department personnel. 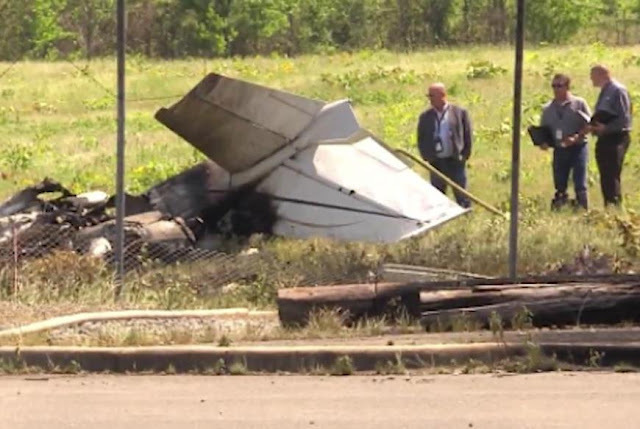 According to FAA records, the 30-year-old pilot held a commercial pilot certificate with single-engine land, multi-engine land, and instrument airplane ratings. He was type-rated for the Mitsubishi MU-300 and Hawker 400 twin-turbofan business jets. His most recent FAA first-class medical certificate was issued on November 25, 2015, with no restrictions or limitations. The pilot's application for the airline transport pilot certificate, dated May 4, 2016, listed a total flight time of 950 hours, of which 612 hours were accumulated in multi-engine airplanes. He reported 377 hours of flight experience as pilot-in-command, 194 hours at night, 162 hours in instrument conditions, and 4 hours in Cessna 310F airplanes. The pilot was a captain with the Air National Guard who typically flew four-engine turboprop Lockheed C-130 airplanes. According to available records, the pilot's most recent military flight was flown on April 9, 2016, in a Lockheed C-130H3 airplane. According to FAA records, the 56-year-old pilot examiner held an airline transport pilot certificate with a rating for airplane multi-engine land and commercial privileges for airplane single-engine land and sea. He was type-rated for the Cessna 500, Cessna 560XL, Cessna 650, Dassault Falcon 50, and Dassault Falcon 900 business jets. He also held a flight instructor certificate with airplane single- and multi-engine and instrument airplane ratings. His most recent FAA second-class medical certificate was issued on July 24, 2015, with a limitation for corrective lenses. His initial authorization as an FAA designated pilot examiner was on September 28, 1995, and his latest examiner renewal was approved by the FAA on January 21, 2016. He was designated an examiner for private, commercial, instrument airplane, air transport pilot, flight instructor, flight instructor renewals, sport pilot, and sport pilot instructor certificates. He was authorized to administer checkrides in single-engine land airplanes, single-engine sea airplanes, and small multi-engine airplanes. The pilot examiner's flight history was established using his logbook. The final logbook entry was dated May 2, 2016, at which time he had accumulated 12,214 total hours of flight experience. He had logged 11,967.2 hours as pilot-in-command, 4,217.4 hours in single-engine airplanes, and 7,918.3 hours in multi-engine airplanes. He had accumulated 1,405.7 hours at night, 1,121.9 hours in actual instrument conditions, and 111.9 hours in simulated instrument conditions. He had flown 80.6 hours during the year before the accident, 74.4 hours during the 6 months before the accident, 57.2 hours during the 90 days before the accident, and 17.2 hours during the month before the accident. There was no record that he had flown during the 24 hours before the accident. The examiner had flown 20.2 hours in the accident airplane make/model during year before the accident. His most recent flight review, as required by 14 CFR 61.56, was completed on April 17, 2016. The airplane, serial number 310-0070, was manufactured in 1961 and was a low-wing monoplane of conventional aluminum semimonocoque construction. The airplane was powered by two 260-horsepower, 6-cylinder, Continental IO-470-D reciprocating engines. The engines provided thrust through two constant-speed, full-feathering, two-blade, Hartzell HC-C2YF-2CUF propellers. The five-seat airplane was equipped with a retractable tricycle landing gear and wing flaps and had a maximum allowable takeoff weight of 4,830 pounds. The airplane had two fuel tanks, one located at each wingtip, and a total fuel capacity of 100 gallons. The FAA issued the airplane a standard airworthiness certificate on February 6, 1961. The owner/operator, Lashbrook Inc., purchased the airplane on May 3, 2015. According to maintenance documentation, the most recent annual and 100-hour inspections were completed on May 1, 2016, at 6,035.3 total airframe hours. The recording hour meter was destroyed during the postimpact fire, which precluded a determination of the airplane's total service time at the time of the accident. The static system, altimeter system, automatic pressure altitude reporting system, and transponder were last tested on May 9, 2014. As of the most recent annual inspection, the left engine, serial number 105176, had accumulated a total service time of 3,020.5 hours since new and 324.2 hours since being overhauled on August 1, 2003. The left propeller, serial number AN7313B, had accumulated a total service time of 720.1 hours since new and 273.4 hours since being overhauled on July 16, 2007. As of the most recent annual inspection, the right engine, serial number 79315, had accumulated a total service time of 5,937.5 hours since new and 1,735.5 hours since being overhauled on April 16, 1990. The right propeller, serial number AN7312B, had accumulated a total service time of 720.1 hours since new and 273.4 hours since being overhauled on July 16, 2007. A postaccident review of the available maintenance records found no history of unresolved airworthiness issues. According to airplane manufacturer documentation, the minimum controllable airspeed (Vmc) for the airplane was 80 mph, the single-engine best angle-of-climb (Vxse) was 95 mph, and Vyse was 111 mph. A postaccident review of available meteorological data established that day visual meteorological conditions prevailed at the accident site. 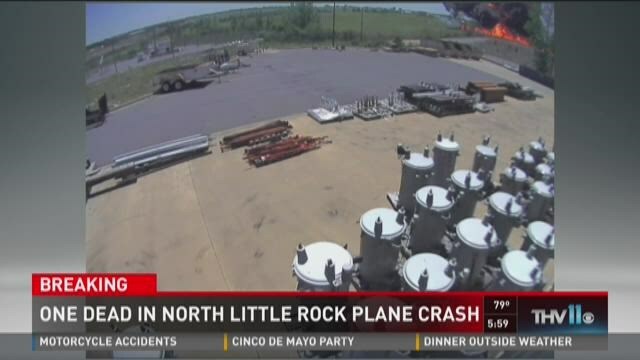 The nearest aviation weather reporting station was located at Bill and Hillary Clinton National Airport/Adams Field (LIT), Little Rock, Arkansas, about 7.7 miles south-southeast of the accident site. At 1253, about 38 minutes before the accident, the LIT automated surface observing system reported wind from 320° at 13 knots with wind gusts of 19 knots, 10 miles surface visibility, few clouds at 25,000 ft agl, temperature 24°C, dew point 5°C, and an altimeter setting of 30.01 inches of mercury. At 1353, about 22 minutes after the accident, LIT reported wind from 340° at 7 knots, surface visibility 10 miles, few clouds at 4,500 ft agl, temperature 25°C, dew point 5°C, and an altimeter setting of 29.99 inches of mercury. ORK, a public airport located about 4 miles north of North Little Rock, was owned and operated by the City of North Little Rock, Arkansas. The airport field elevation was 545 ft msl. The airport was served by two runways, runway 5/23 (5,002 ft by 75 ft, concrete) and runway 17/35 (3,019 ft by 75 ft, asphalt). The airport was not equipped with an air traffic control tower. The initial impact point was in an industrial yard located about 0.17 miles east-northeast of the runway 17 displaced threshold and 0.13 miles south of West Maryland Avenue. Fragments of the left wingtip navigation light lens cover were found along a curb located about 27.5 ft past the initial impact point on a 170° magnetic heading. 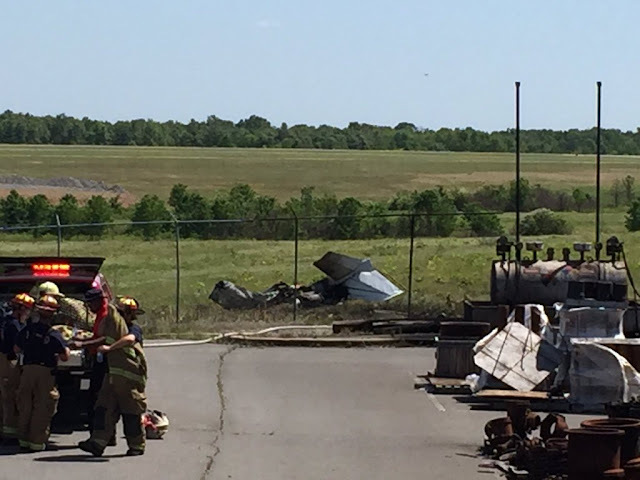 The wreckage debris path continued through an electrical service line and the airport perimeter fence. The main wreckage came to rest in an open grass field about 186 ft from the initial impact point. The left engine and its propeller, which separated from the left wing during impact, were located an additional 108 ft past the main wreckage. The main wreckage consisted of the fuselage, both wings, empennage, and the right engine and its propeller. A majority of the fuselage, including the cockpit and instrument panel, was destroyed during the postimpact fire. Flight control cable continuity could not be established due to impact damage; however, all observed separations were consistent with overstress. Mechanical continuity from the engine components to their respective cockpit controls could not be established due to impact damage. The engine control quadrant was destroyed by postimpact fire, which precluded an accurate determination of the individual lever positions at the time of impact. Measurement of the flap actuator was consistent with the flaps being fully retracted at the time of impact. Measurements of the landing gear actuators were consistent with the landing gear being fully retracted at the time of impact. A majority of the fuel system was damaged during impact and the postimpact fire. Both fuel tanks were destroyed during impact and postimpact fire. The right fuel selector was found positioned to draw fuel from the right fuel tank. The left fuel selector separated from the airframe during impact, which precluded an accurate determination of its preimpact position. Both auxiliary fuel pump switches were destroyed during the postimpact fire. 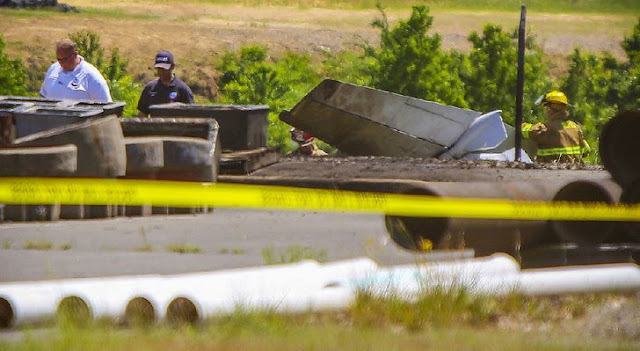 The postaccident airframe examination did not reveal any evidence of a mechanical malfunction that would have precluded normal operation during the flight. The left engine separated from its mounts during impact. Internal engine and valve train continuity were confirmed as the engine crankshaft was rotated. Except for the No. 6 cylinder, compression and suction were noted in conjunction with crankshaft rotation. The push rod for the No. 6 cylinder exhaust valve exhibited impact damage that prevented the valve from seating properly during the compression test. Both magnetos provided spark from each ignition tower when the drive shaft was rotated on a test bench. The spark plugs exhibited normal wear features; however, they were dark in color, consistent with carbon fouling. The mechanical fuel pump rotated smoothly, and its drive pin was intact. Fuel was present in the hoses connected to the mechanical fuel pump. No anomalies were observed with the throttle body metering unit, fuel manifold valve, or fuel injectors. The throttle body metering unit's inlet fuel screen contained minor fiber contamination. The fuel manifold valve contained fuel and its filter screen did not exhibit any contamination. All fuel injectors were open and clear of debris. The oil pump discharged oil in conjunction with crankshaft rotation. The oil pickup screen was intact and covered in oil with no obstructions. The oil filter element was free of visible metal contaminants. The propeller governor separated from the engine during impact, and the observed damage precluded functional testing. There were no anomalies observed with the cylinders, pistons, valves, or valve seats. Additionally, there were no anomalies with the crankshaft, connecting rods, bearings, or counterbalance weights. There was no evidence of a preimpact mechanical malfunction that would have precluded normal operation of the left engine during the flight. The right engine separated from its mounts and remained attached to the wing through control cables. Internal engine and valve train continuity were confirmed as the engine crankshaft was rotated. Compression and suction were noted on all cylinders in conjunction with crankshaft rotation. Both magnetos provided spark from each ignition tower when the drive shaft was rotated on a test bench. The spark plugs exhibited features consistent with normal engine operation. The mechanical fuel pump rotated smoothly, and its drive pin was intact. Fuel was present in the hoses connected to the mechanical fuel pump. No anomalies were observed with the throttle body metering unit, fuel manifold valve, or fuel injectors. The throttle body metering unit's inlet fuel screen was free of contamination. The fuel manifold valve contained fuel and its filter screen did not exhibit any contamination. All fuel injectors were open and clear of debris. The oil pump discharged oil in conjunction with crankshaft rotation. The oil pickup screen was intact and covered in oil with no obstructions. The oil filter element was free of visible metal contaminants. The propeller governor functioned normally when bench tested. There were no anomalies observed with the cylinders, pistons, valves, or valve seats. Additionally, there were no anomalies with the crankshaft, connecting rods, bearings, or counter-balance weights. There was no evidence of a preimpact mechanical malfunction that would have precluded normal operation of the right engine during the flight. The left propeller remained attached to the engine crankshaft flange and exhibited limited leading-edge damage to one of the two blades. The other blade exhibited an aft bend. A teardown examination determined that the propeller was not in a feathered position at the time of impact and that both blades appeared to be at or near the start lock position. There was no evidence of a preimpact mechanical malfunction that would have precluded normal operation of the left propeller during the flight. The right propeller remained attached to the engine crankshaft flange and exhibited prominent leading-edge gouging and chordwise scoring on the camber side of both blades. One blade displayed S-shape bending and the other blade was bent aft. A teardown examination determined that the propeller was forcibly rotated toward the low pitch stop during impact. There was no evidence of a preimpact mechanical malfunction that would have precluded normal operation of the right propeller during the flight. Additional documentation for each engine and propeller examination is included in the docket materials associated with the investigation. The Arkansas State Crime Laboratory, Little Rock, Arkansas, performed an autopsy on the pilot examiner. The cause of death was attributed to thermal injuries sustained during the accident. The FAA's Bioaeronautical Sciences Research Laboratory, Oklahoma City, Oklahoma, performed toxicology tests on specimens obtained during the autopsy. The pilot examiner's toxicology results were negative for carbon monoxide, ethanol, and all tested drugs and medications. According to Hartzell Propeller Owner's Manual No. 115N, the constant-speed propellers were hydraulically operated with feathering capability. Oil pressure provided by the propeller governor was used to move the blades toward low pitch (blade angle). A feathering spring, counterweights, and an air charge moved the blades toward high pitch and into feather in the absence of governor oil pressure. The propellers were also equipped with spring-energized latches (start locks) to keep the propeller blade angle low to minimize torque during engine start. The start locks engage the feathering high pitch stops when engine speed decreases below about 800 rpm. According to the propeller manufacturer, for a propeller to be found on the start locks after an accident, the propeller blade angle at impact was either at or below the start lock angle when engine speed decreased below 700-900 rpm, or the blade forces during impact moved the blade angle into a start lock position after engine speed decreased below 700-900 rpm. FAA Special Airworthiness Information Bulletin No. CE-05-51 describes a scenario in which the propeller of an inoperative engine did not feather because the windmilling speed had decreased below the propeller's start lock engagement speed. The bulletin states that a windmilling propeller produces a large amount of parasitic drag in a twin-engine airplane with one engine inoperative, which can result in the airplane's total drag exceeding the power available and an inability to maintain level flight. The Cessna 310F Owner's Manual states that, in an event of a loss of engine power shortly after liftoff, a pilot should maintain the Vyse speed of 111 mph unless there are obstructions which require a steep climb to avoid. The manual further stipulates that allowing the airspeed to fall below the Vxse speed of 95 mph would reduce or eliminate the airplane's ability to climb with one engine inoperative. 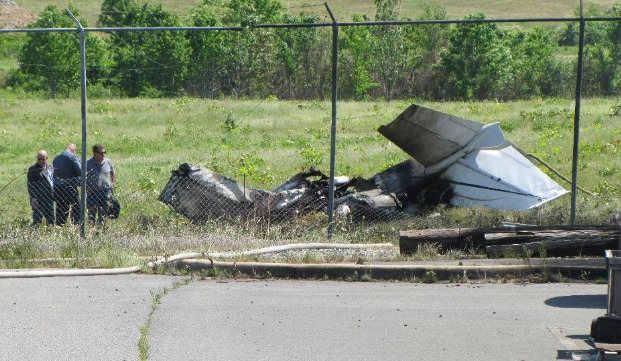 The Cessna Pilot Safety and Warning Supplements states that, in event of a loss of engine power during takeoff, "prompt retraction of the landing gear, identification of the inoperative engine, and feathering of the propeller is of utmost importance if the takeoff is to be continued." The supplement further states that a windmilling propeller will severely degrade climb performance with one engine inoperative. Additionally, the supplement states that if an immediate climb is not necessary for obstacle clearance, a pilot should maintain Vyse, because it will provide the best chance of climb or least altitude loss during single-engine flight. 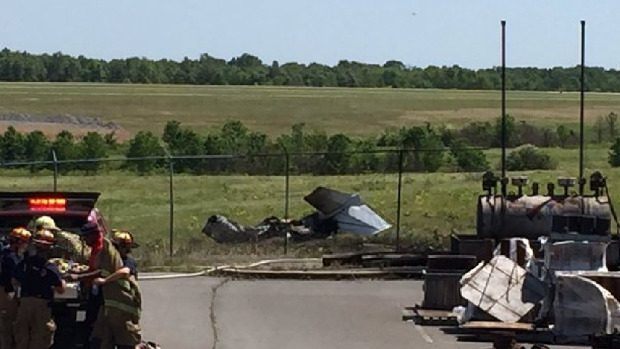 On May 5, 2016, about 1331 central daylight time, a Cessna model 310F twin-engine airplane, N6770X, was destroyed when it impacted terrain following a loss of control near the North Little Rock Municipal Airport (ORK), North Little Rock, Arkansas. A postimpact fire ensued. The airline transport pilot (ATP) applicant sustained serious injuries. The pilot examiner was fatally injured. The airplane was registered to and operated by Lashbrook Inc. under the provisions of 14 Code of Federal Regulations Part 91 as an instructional flight. Day visual meteorological conditions (VMC) prevailed for the local area flight that was originating at the time of the accident. 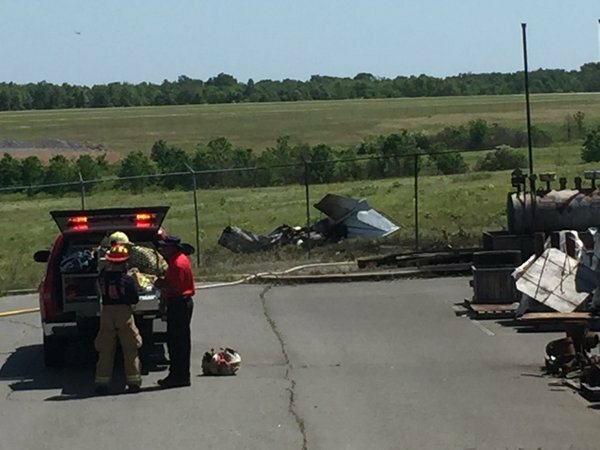 The accident occurred during an ATP checkride that was being administered by a Federal Aviation Administration (FAA) designated pilot examiner. According to available radar track data, at 1329:43 (hhmm:ss), the accident airplane appeared on radar shortly after departing from runway 5 and did not subsequently climb above 800 feet msl. The airplane continued on a northeast heading of 050 degrees for approximately 24 seconds before it entered a left turn to a southwest heading of 225 degrees. The 175 degree left turn took about 29 seconds to complete and had a turn radius of about 1/3 mile. The turn rate averaged about 6 degrees per second during the left turn. After completing the left turn, the airplane continued to the southwest, on a ground track toward runway 17, while maintaining 800 feet msl, until the final recorded radar point at 1330:56. The final radar data point was located about 1/3 mile northeast of the runway 17 displaced threshold. Preliminary performance calculations, based on available radar data, indicated that the airplane initially maintained a calculated true airspeed of 85-96 knots during the upwind leg from runway 5; however, the calculated true airspeed decreased from 96 knots to 84 knots during the left turn to the southwest. During the final 20 seconds of recorded radar data, the calculated true airspeed further decreased from 84 knots to 79 knots. According to airplane manufacturer documentation, the minimum controllable airspeed (Vmc) for the accident airplane was 70 knots (80 mph), the single-engine best angle-of-climb (Vxse) was 83 knots (95 mph), and the single-engine best rate-of-climb (Vyse) was 97 knots (111 mph). A witness photographed the airplane shortly before it impacted the ground. According to the associated file metadata, the photo was captured at 1330:59. At that time, the airplane was observed in a left wing low, 45-degree bank, in a slightly nose low attitude. Additional review of the photograph established the airplane was on a southerly heading and was at or below treetop level. A surveillance camera partially captured the accident impact sequence. The surveillance camera's field-of-view was aligned to the southwest and primarily focused on an industrial yard that was located about 450 feet east of the initial impact point. At 1331:00.35 (hhmm:ss.ss), the accident airplane appeared in the upper right corner of the field-of-view; however, the airplane was partially obscured by a tree that was positioned between the camera and the initial impact point. At 1331:00.54, a fire/explosion emerged and continued to grow, over a period of about 2.6 seconds, as the impact sequence progressed from right-to-left in the field-of-view. At 1331:02.35, the left engine emerged from the central explosion, tumbling away from the main wreckage, and came to rest in an open field about 1331:07.35. A ground fire was observed along the debris path and the associated smoke plumes appeared to drift toward the southeast. There was a power interruption to the surveillance camera, between 1331:15.78 and 1337:35.72. When the footage resumed, a majority of the ground fire had subsided; however, the main wreckage remained on fire. There was a second power interruption, between 1337:55.76 and 1342:44.66. After the footage resumed, the fire at the main wreckage had been extinguished by responding fire department personnel. Following the accident, several fire department personnel spoke with the ATP applicant concerning the accident flight. 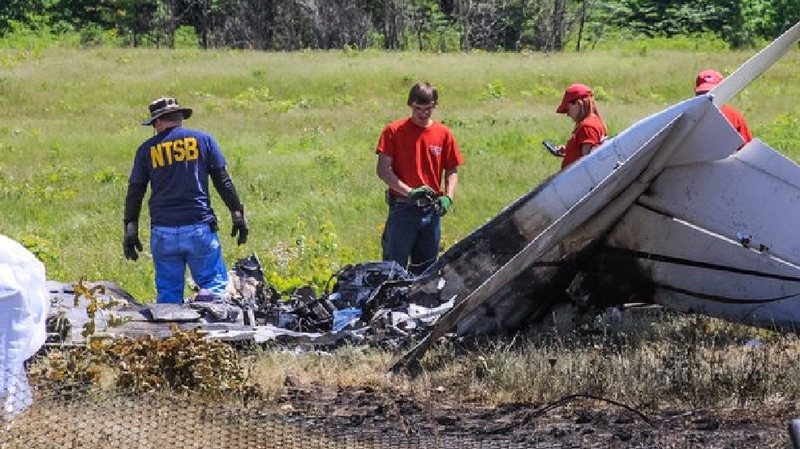 When asked what had occurred during the flight, the ATP applicant told the fire department personnel that the left engine had experienced a loss of engine power shortly after takeoff. The ATP applicant further stated that, following the loss of left engine power, the examiner took over airplane control and was attempting to fly the airplane back to the airport when the accident occurred. The ATP applicant was not interviewed by the NTSB or the FAA before the release of this preliminary report. Although attempts were made to interview the ATP applicant at the hospital, his on-going medical treatment precluded an interview or his providing a written statement. The ATP applicant was a captain with the Air National Guard and typically flew four-engine turboprop Lockheed C-130 airplanes. The ATP applicant also held a FAA commercial pilot certificate with single-engine land, multiengine land, and instrument airplane ratings. His application for the ATP certificate, dated May 4, 2016, listed a total flight time of 950 hours, of which 612 hours were accumulated in multiengine airplanes. The pilot examiner held a FAA ATP certificate with single-engine land, single-engine sea, multiengine land, and instrument airplane ratings. The pilot examiner also held a flight instructor certificate with single-engine, multiengine, and instrument airplane ratings. According to a FAA medical application, dated July 24, 2015, the pilot examiner had accumulated 12,257 hours of flight time. At 1253, about 38 minutes before the accident, an automated surface observing system located at Bill and Hillary Clinton National Airport/Adams Field (LIT), about 7.5 miles south of the accident site, reported the following weather conditions: wind 320 degrees true at 13 knots, gusting 19 knots; surface visibility 10 miles; few clouds at 25,000 feet agl; temperature 24 degrees Celsius, dew point 5 degrees Celsius, and an altimeter setting of 30.01 inches of mercury. At 1353, about 22 minutes after the accident, the LIT automated surface observing system reported the wind 340 degrees true at 7 knots, surface visibility 10 miles, few clouds at 4,500 feet agl, temperature 25 degrees Celsius, dew point 5 degrees Celsius, and an altimeter setting of 29.99 inches of mercury.